JOHNNY SEXTON’s fame and renown comes from his capacity to deliver in the big moments. His greatness comes from his stunning ability to make every involvement he has in the game count. 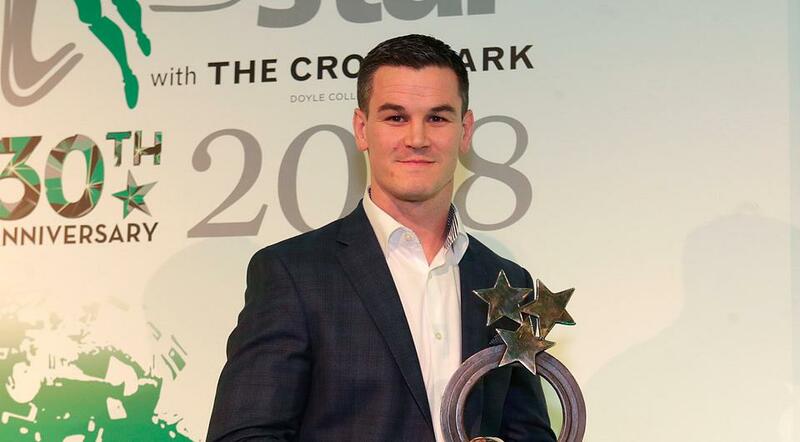 Tonight, the Ireland out-half collected the Irish Independent Sportstar of the Year award in association with the Croke Park Hotel, while his drop-goal in Paris was voted 2018’s 'Magic Moment' by the readers of this newspaper and independent.ie. That score will endure in Irish sporting history and will be the climactic moment of the out-half’s show reel when his career is reduced to montages of his greatest hits. The 41-phase move to engineer the last-gasp win over France that kick-started Irish rugby’s greatest season had Sexton’s fingerprints all over it. The finish was just the tip of the ice-berg; his restart was hung high for Iain Henderson to collect, his communication and leadership in a state of deep fatigue marshalled the team slowly but surely up the field and when progress slowed and the envelope needed pushing his cross-kick to Keith Earls was pinpoint in its accuracy. He might have preferred a closer-range kick, but he knew that the forwards were fatiguing and the chances of an error in poor conditions was mounting by the phase, so he dropped into the pocket and delivered a stunning effort from just inside the French half. It was a gargantuan team effort, but as the spiritual leader of the team it was Sexton who drove them forward; always demanding more but ultimately taking the responsibility for delivering. It set in train a sequence of events that led to the No 10 earning a place in history as a Grand Slam winner. The five wins all bore his stamp; whether it was the sensational flat pass to Jacob Stockdale and the smashing hit on Ross Moriarty against Wales, or the calm decision-making on that bitterly cold afternoon in Twickenham; the 33-year-old delivered on every front. His quiet touches always have an impact; his capacity to think beyond the current phase keeps Ireland one step ahead. His willingness to get stuck into the less glamorous side of the game on defence and around the ruck may give his coaches palpitations, but it earns the respect of his team-mates and opponents. His passion might lead to tense interactions with referees, but it shows how much he cares about his team and the result. He went on to drive Leinster to a fourth European Champions Cup title and after taking the semi-final win over Munster off, he returned to claim the Guinness PRO14 with his province. With Rory Best out, he co-captained Ireland in Australia, returning to the team after Joe Schmidt gave Joey Carbery a first Test opportunity to wrest back control of the series. When Peter O’Mahony went off in the decider, the team were Sexton’s to lead and he stepped up to the plate in a tense affair. His unbeaten sequence of starts came to an end in Toulouse, but a couple of weeks later he was at the heart of another historic day in green as he guided Ireland to a first home win over New Zealand. That success ultimately secured the World Rugby Player of the Year award for him, to which he added the Rugby Writers of Ireland and RTÉ gongs before his latest success at Croke Park last night. A team man with little ego, Sexton has absorbed the recognition with more than a little discomfort from the attention it brings. No matter how successful he is, he rarely looks comfortable on a stage with a microphone in front of him, taking the plaudits from an appreciative crowd. He has paid tribute to his wife Laura’s support and influence and his young family’s role in keeping him grounded, while he has cut a more relaxed figure off the pitch, even if he retains the competitive edge that stands him apart off it. It has been an amazing year for Irish sport, but the readers of the Irish Independent endorsed the 33-year-old in record numbers. When 2018 features on 'Reeling in the Years', Sexton will feature prominently. Recently, he signed a new contract to confirm that he believes he can continue to perform at the highest level and having put a frustrating run of injuries behind him, he has never been better than he is right now. There is a lot to look forward to in 2019 and if Ireland fulfil their potential at next year’s World Cup there is every chance that Sexton will be busy with award nights this time next year as well. But there is merit in dwelling for a while on the year just gone and savouring the success that Sexton and his teams enjoyed over the course of a remarkable 12 months for Irish rugby. It all started in the pouring Paris rain and flowed from there. And at every step, Sexton was there driving standards and delivering performances. He deserves this accolade and every other one he gets.